Hey everyone! I know I’ve gotten some new friends recently, courtesy of Jacquelynne Steve’s Christmas Countdown which featured a few of my Christmas tutorials among many others (thanks, Jaquelynne!). So, I wanted to check in, show you a few little things I’ve been working on and to say “welcome”! I just finished my 4th block from last year’s Sew Sweet Simplicity BOM which Jacquelynne hosted last year (the pattern is available for purchase as a pdf download). I’m now ready to add the sashing and borders. One step closer to a finished quilt top! 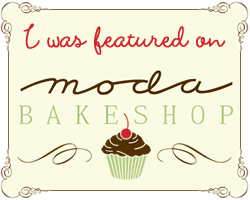 Have you heard about Moda’s latest temptation called Frivols? Beginning this month, they have started a series of monthly collectible tins that contain all kinds of goodies that we quilters are sure to love. So, when my local quilt shop got them in stock, I had to have one! 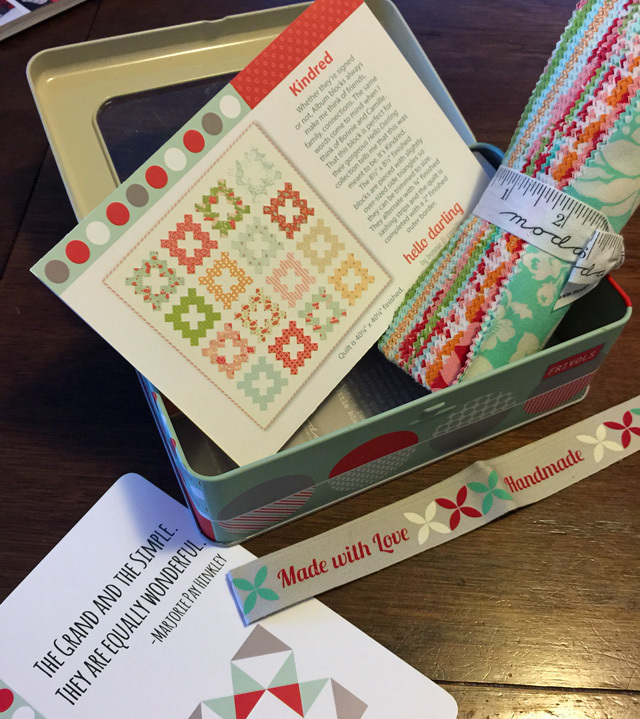 The first tin contains a special precut of Bonnie & Camille’s latest line, Hello Darling, a pattern, coordinating ribbon, and a keepsake quote. 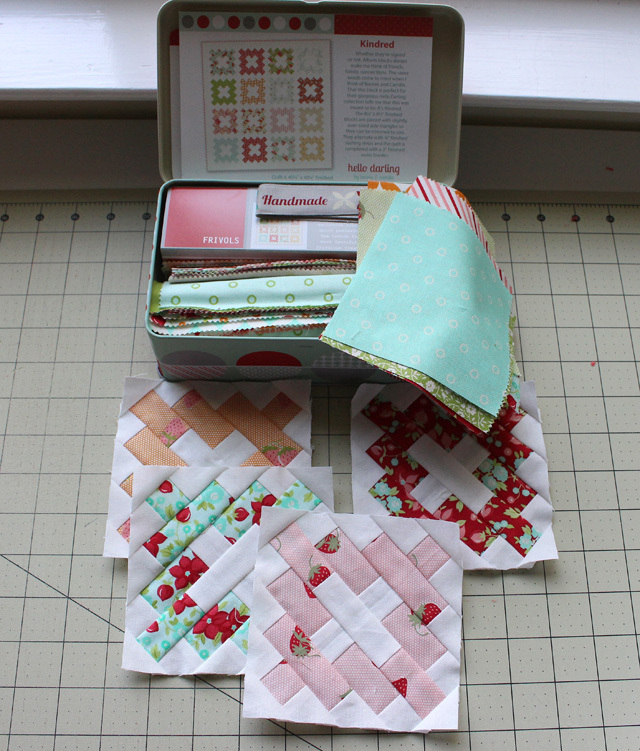 I immediately thought that the enclosed pattern would be really cute as a mini quilt. So what did I do? I drafted it at half the size and started cutting! I got 4 squares completed and called it quits. It just wasn’t grabbing me, and I don’t have time for projects that don’t speak to my heart. 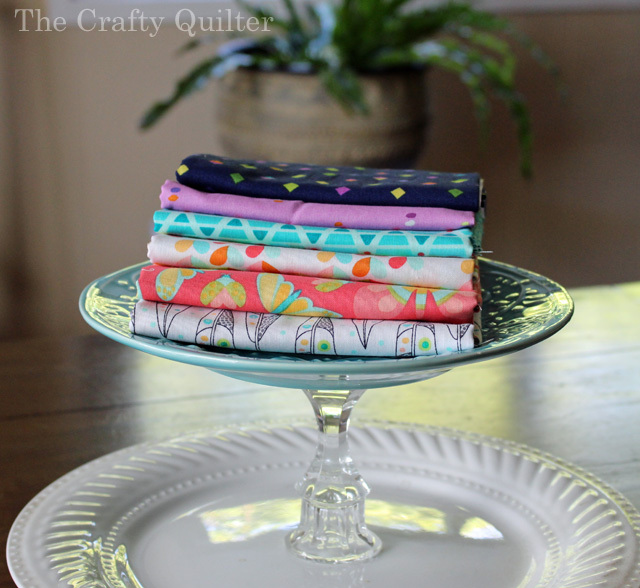 Now I have four 4 1/2″ squares that need a new home. I’m sure I’ll think of something. 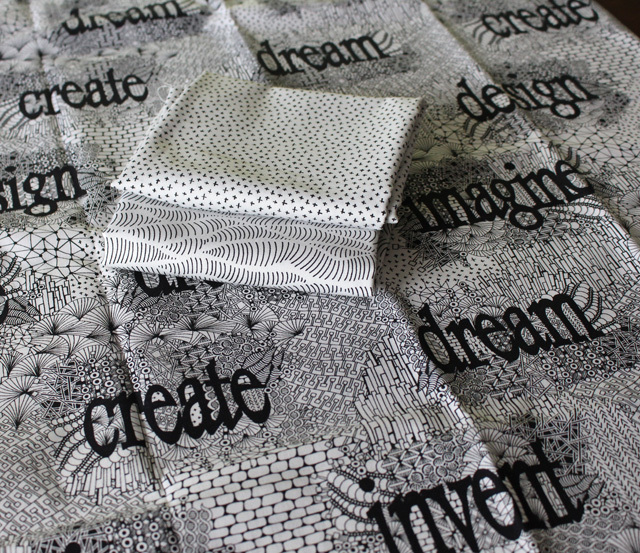 The latest addition to my stash is some fun black & white prints from Windham Fabrics. This collection is called Imagine from Another Point of View. The text print is my favorite! 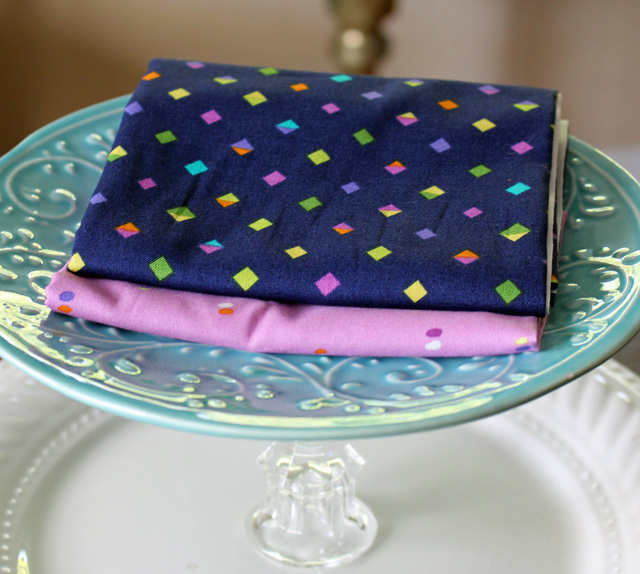 I also had to bring home this group of half-yard cuts (also from The Granary Quilt Shop) that are so bright and cheerful! 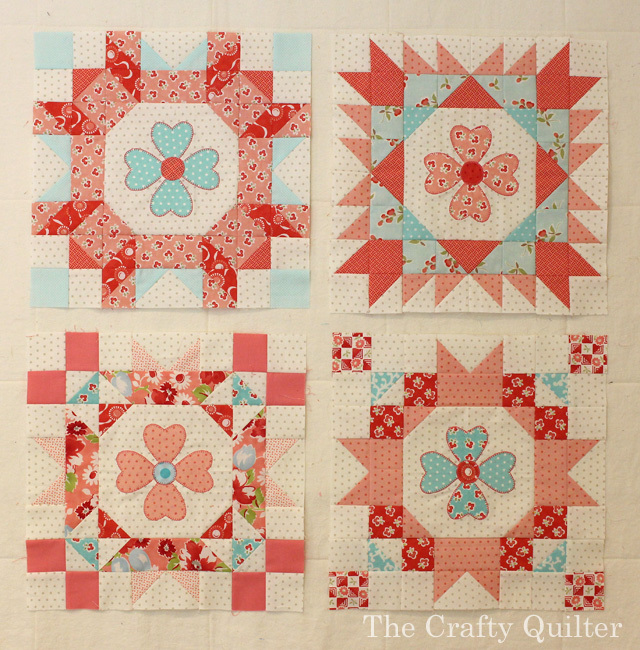 The two prints on top are Melodies by Sarah Campbell for Michael Miller Fabrics. I love the navy and purple combination. I see a little girl’s dress or skirt in the future! The bottom portion of the stack are my current, favorite color palettes. These are from the collection, Birds & the Bees by Tamara Kate for Michael Miller Fabrics. I’m not sure what these will become, but I couldn’t live without them had to have them! 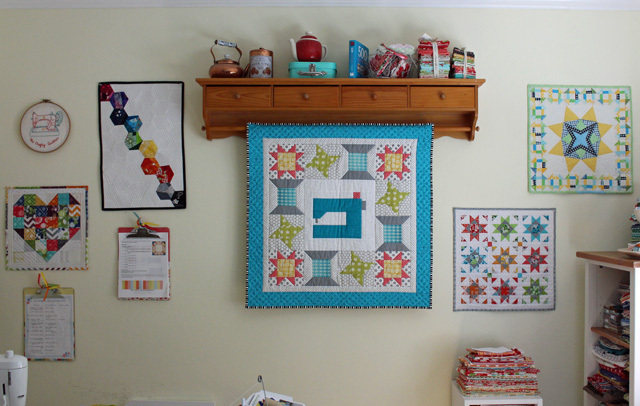 I finally hung up some mini quilts on a wall in my sewing room. This is the first thing I see when I enter the room. The two on top (left and right of center) are from swaps on Instagram (and I adore them). The bottom two on each side are ones I made myself. The center quilt changes depending on the season. I also organized the top of this corner bookshelf. It holds my silk thread collection and a few fat quarter towers. 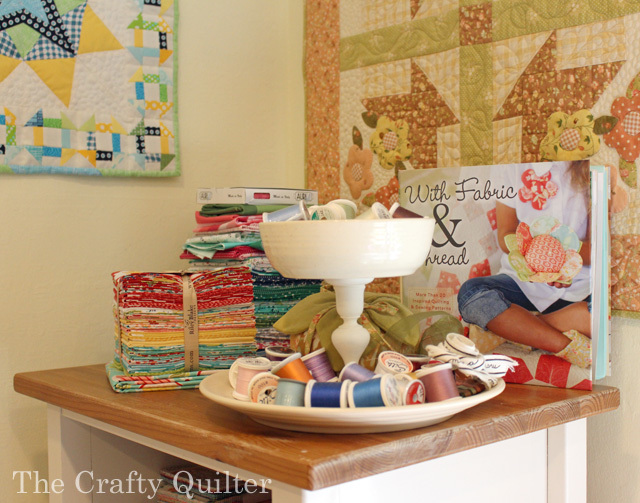 The book, With Fabric and Thread, is always on display (really it’s calling my name to make something from it). Currently (as in today, tomorrow and Saturday) I’m getting ready for my daughter’s wedding shower. It’s taking place on Saturday at our house. Her bridesmaids are the main party coordinators, but I am the hostess. That means plenty of cleaning and decorating! Today, I tackled the entryway and the garden. Starting from the top is a mirrored window that I rescued from the Goodwill. 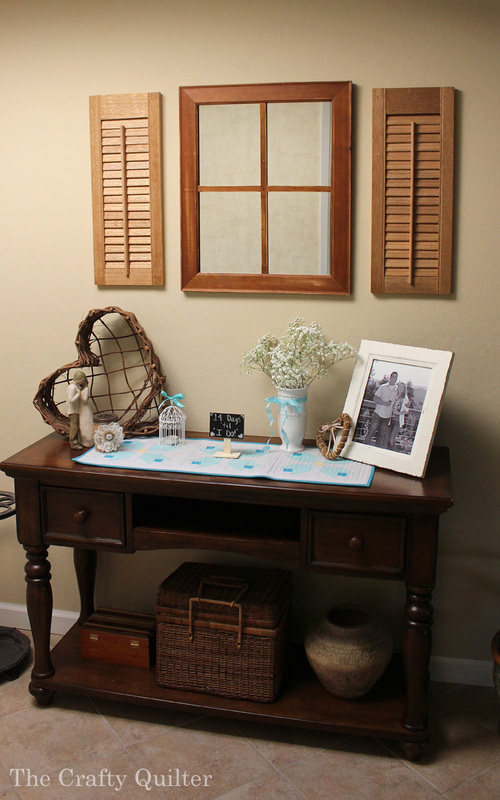 The two shutters I picked up last weekend at a garage sale. 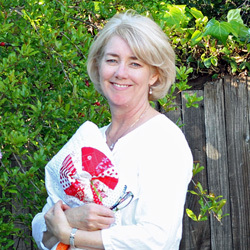 The grapevine heart is also from the Goodwill. 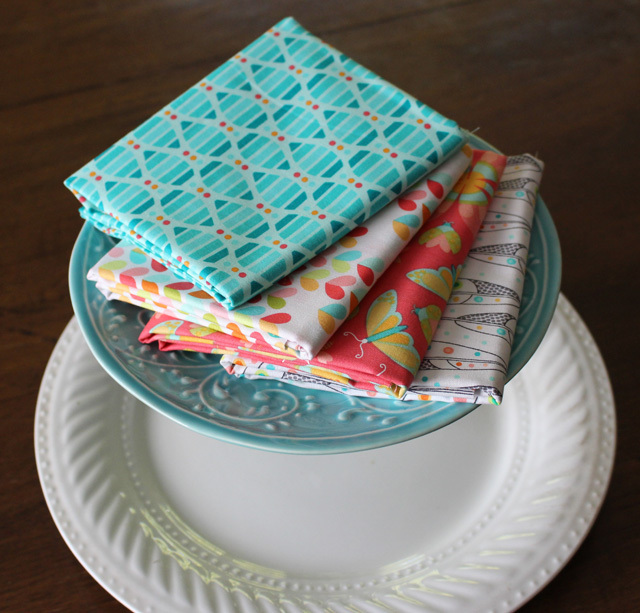 The table runner was featured in Fat Quarterly Ezine several years ago. 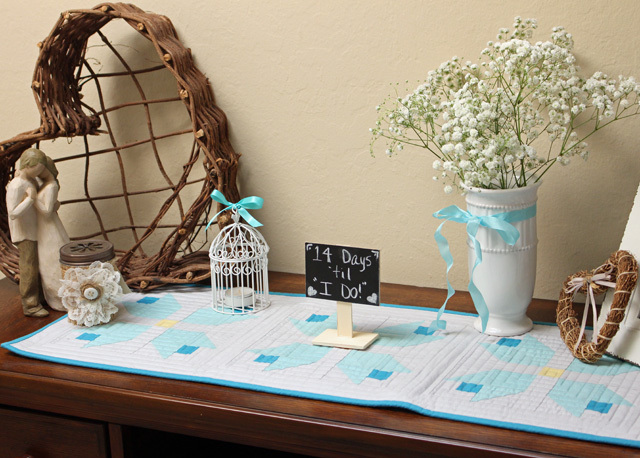 It’s perfect for the color scheme which is turquoise, gold and white. There’s nothing like a party to get you in clean-up mode! Last weekend, Mr. 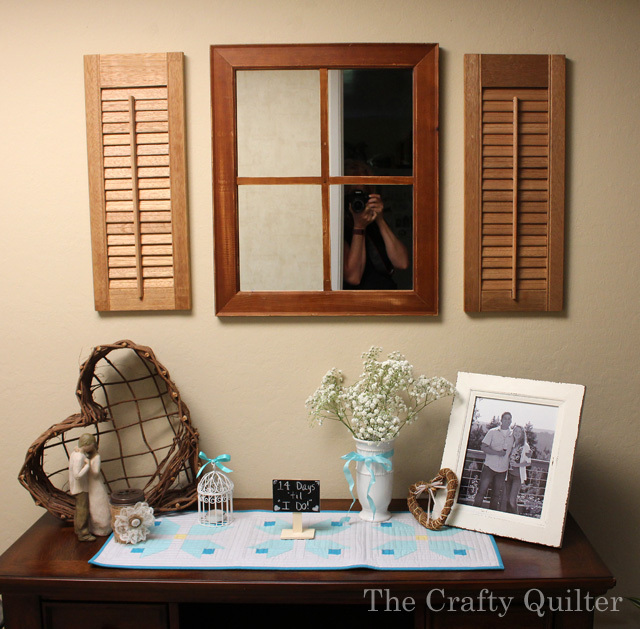 Crafty Quilter and I washed all of the windows inside and out. That’s a big job, and I must admit that it was 80% Mr. and 20% Mrs. doing the work. He’s a keeper! These days I’m focusing on the wedding shower and the upcoming wedding which takes place on September 12. I’ll try to keep you posted with updates. I know many of you are in back-to-school mode. That used to be one of my favorite times of the year; starting out fresh and an empty house for a few hours. One last thing. 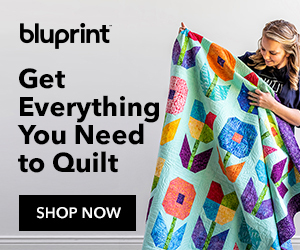 I hope you all have had a chance to check out The Quilt Show videos. 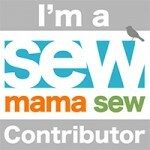 My latest segment is on binding by machine and joining your binding tails with a diagonal seam. There will be another one next week on binding by hand. 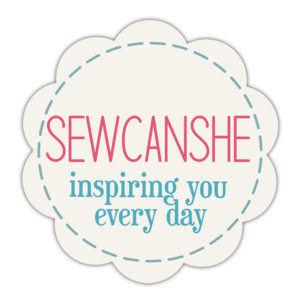 You can still use the coupon code CRAFTYT082015 to get a free, one-month membership. You don’t need to be a member to watch the videos, but I’m sure you’ll enjoy all of the perks that go along with it! I hope you all have a great weekend ahead of you, and thanks for letting me be a part of your cyberspace! 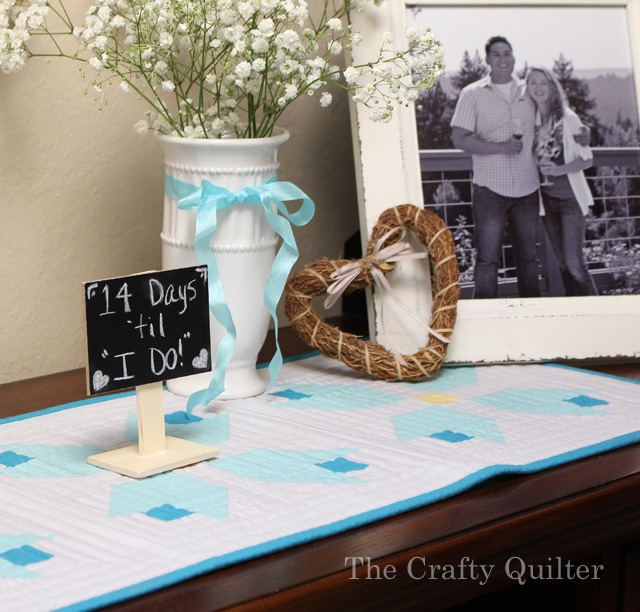 I think it would be really cute to use your 4″ squares in the center of a table runner, and make the full size blocks on either side of it…. since you already have the 4 small blocks you could probably make 2 big ones pretty quickly, and if its still not your favorite pattern, at least Christmas is coming! Congrats to your family on the wedding! So much pretty stuff on your post…but your daughter will outshine everything on her special day! I hope you will look at those little 4 1/2 ” blocks again later. They will surely melt your heart the next time you see them. They are so cute!!! to enjoy theses special events. Thanks for that great tutorial. I learned two new tips. Can’t wait to try it. 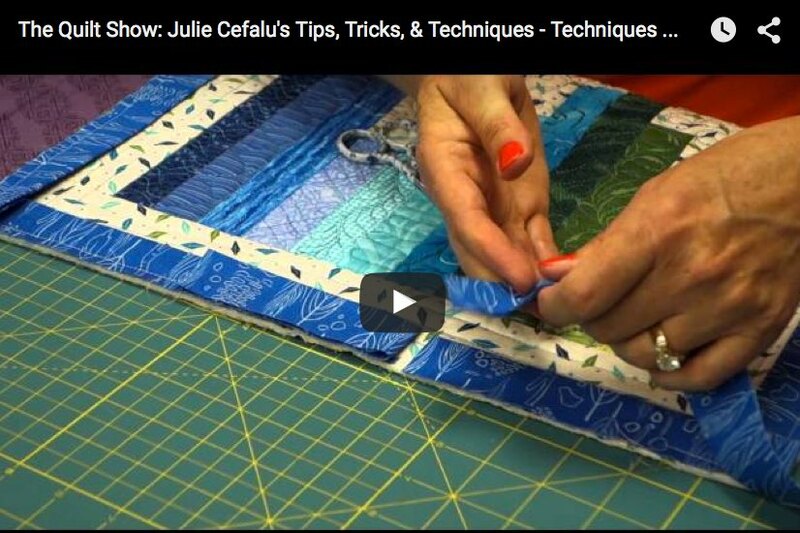 Julie, thank you for your great binding tip. Can’t wait to try it. Waiting patiently for next tip. it, gave me some ideas. good to see the BOM blocks, you are more ahead than me still in my to do list but have done the 4 cozy afternoon ones for this year. Great video, Julie. Thanks for sharing it with us. It is the best video on this topic I have ever seen. You are a great teacher. Thank you very much.